RJ Trailer Sales stocks around 200 trailers in many different sizes and up to a 25-ton capacity with custom options available to fit your specific needs. We know what it's like to buy a trailer and later find out that it brings you nothing but problems. Each one sold by us is going to last for the long haul, because we value customers returning and telling their friends about our great quality. Since cost is a big concern for most people these days, we give upfront prices on all items and pass any savings from the manufacturers onto you. An excellent product at good rates is the cornerstone of any successful business, and we have made this the basis of RJ Trailer Sales. 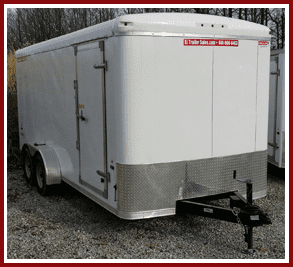 RJ Trailer Sales takes great pride in offering customers throughout the Cleveland, Ohio, area a wide range of trailers for sale at reasonable costs. We have been in business for more than 11 years. With our proven track record, you never have to worry about regretting the decision to buy from us. We are constantly checking on various suppliers' prices, which may change from week to week, so you always receive the best possible deals and avoid the time-consuming process of bargain hunting. Our knowledgeable team is also available at any time for questions and to help you choose the trailer that meets your needs. We believe selling good trailers at the right prices will keep customers coming back year after year. We are happy to answer questions whenever you have them, and we make every effort to ensure shopping on our easy-to-use website is time well-spent. Let us know if you would like more information about a particular trailer or need a price quote. Our main goal is providing quality trailers within your budget. You could take the time to shop around at multiple trailer shops, but you might not feel confident in the level of quality or cost of the trailers found. It does no good to find the trailer you want but can't afford or to settle for a cheap trailer with issues. We offer the perfect combination of value and quality by working directly with manufacturers and seeking out even better deals, so you don't pay a penny more than necessary. 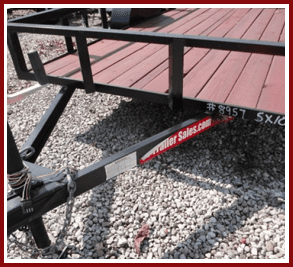 At RJ Trailer Sales, we pride ourselves on only selling trouble-free trailers. We have been in this business long enough to know which brands are at the top level, and we put in a lot of work to make certain you are happy with your purchase. We also carry some accessories, so it's easier for you to find everything in one convenient place. Buy from us to discover what customer satisfaction really is.